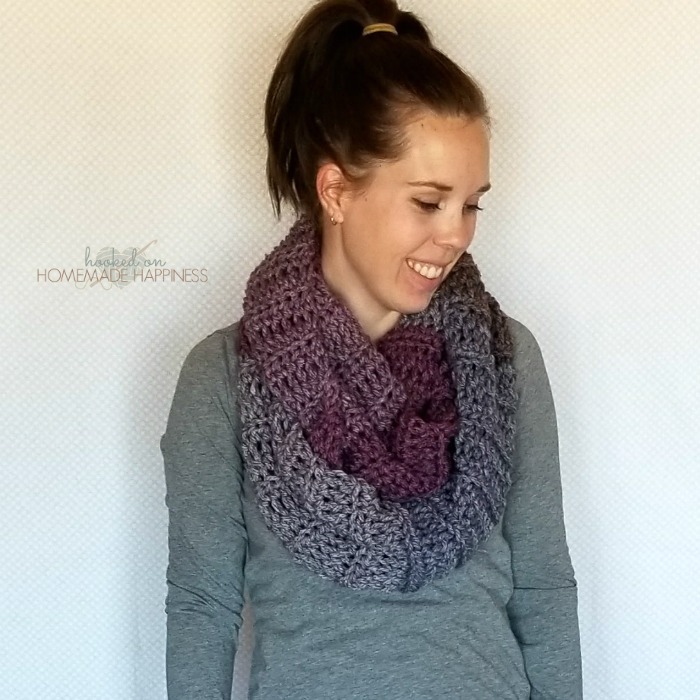 When I say this Easy Textured Scarf is easy, I’m not kidding! 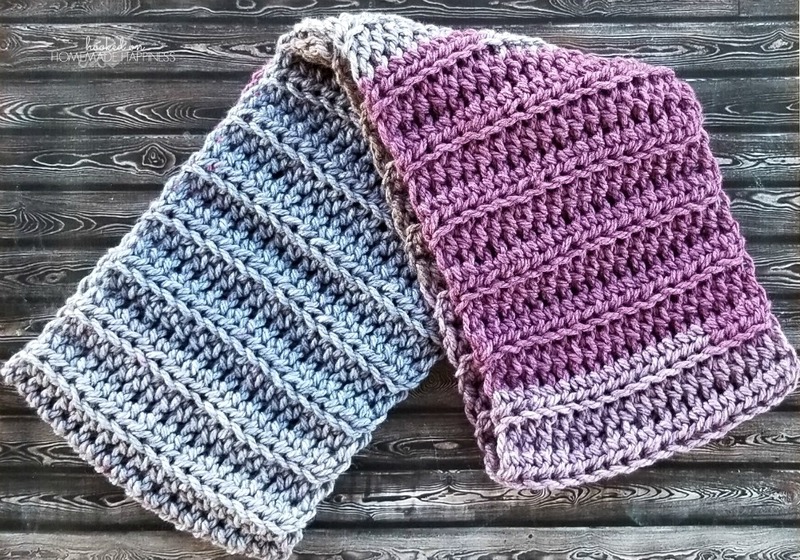 This is an infinity scarf and is perfect for a beginner crocheter looking to make something squishy and comfy. This scarf is super squishy, soft, and is a little bit textured. I used one Caron Tea Cake to make this warm scarf. They’re a bulky weight yarn with beautiful colorways! I love the purples and periwinkle colors in this cake. One cake is enough to make an infinity scarf that wraps around twice. Bring both ends of the scarf together. Use your yarn needle and the long end to whip stitch them together. In the picture of you wearing the scarf it appears to me that you are wearing two scarves, one over the other. How long is this scarf? It is beautiful. Thank you. This is gorgeous! 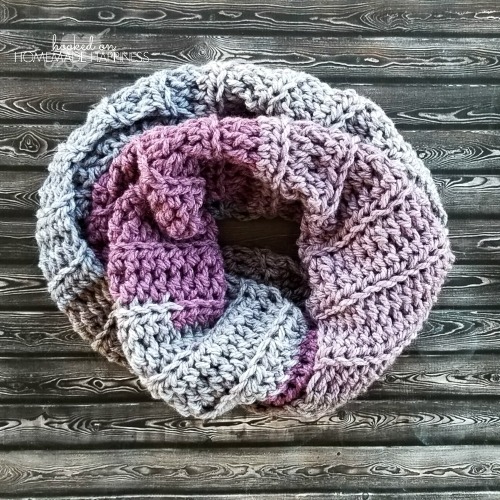 I’m such a sucker for infinity scarves and cowls, and Caron cakes yarns are amazing lol. do you have a hat pattern that would go with this? I love Caron Cakes, too! I don’t have a hat to go with… but that’s a great idea!! Hi did you use a 10 mm p hook or 11.5 mm hook ? I have a p hook that’s is 11.5? Hi! What mm hook did you use? Thank you! What size is that yarn? It looks like worsted weight, 4. It’s super bulky (6). I’m sorry I forgot to mention that! I would like to use a Bulky 5 yarn (trying to use up my stash!). Could you please tell me how wide the scarf is so I can add a few stiches to make up for the thinner wool? Hello 🙂 It’s 8 inches wide and approximately 68 inches long before sewing the ends together. Is there any reason you couldn’t do this in the round? Would it look the same? Sure you could. If you worked in the round the rows would be going the opposite direction. 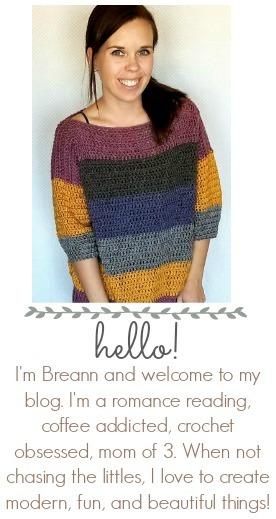 I’m super new at the crochet world. Not sure I can handle this project yet but I love it. Hello, I have a different yarn I’m wonderinf if 64 yrds will be enough? After starting i realized it’s pretty wide. Brand new to crocheting! Oh wow! Darn! I’m having a hard time finding that. Ugh! I’ve checked multiple different stores. I can’t find it anywhere. Can I use size 5 yarn? Otherwise I’ll just have to buy a few more skeins of the other.